Applications and objects using epoxies are safe and pose no risk to human health. The most recent scientific opinion by the European Food Safety Authority (2015) concluded that the use of Bisphenol A in current applications is safe. BPA is a key constituent of epoxy resins, alongside Epichlorohydrin. It is estimated that 85% of the global production of epoxy resin is derived from reacting ECH and BPA. As explained by the EU authorities, levels of BPA found in current food contact applications are very low and well below the safety threshold limit for all age groups. Hence BPA-based products – including epoxy resins in their current uses – are safe for consumers. Similar conclusions were drawn by American and Canadian authorities. Over the past decades, epoxy manufacturers have invested millions of Euros in order to ensure that the highest health, safety and environmental standards are maintained and, where possible, improved. Manufacturers work at every stage of the life-cycle of epoxy resins to combine greater safety with increased performance. In response to the regulatory and media scrutiny affecting Bisphenol A, the ERC has produced a series of studies analysing the potential emissions of BPA during the life cycle of epoxy resins in Europe. The research was conducted by an independent research agency called Beratungsgesellschaft für integrierte Problemlösungen (BIPRO). It looked at the most widely used applications and potential sources of possible BPA losses: water pipes, flooring, marine coatings, automotive, wind rotor blades. BIPRO’s studies concluded that a precise calculation of potential BPA releases was only possible at the production stage of the epoxy resin. Calculations for other life cycle stages are based on assumptions. In most cases, the level of uncertainty was too high and the lack of data from usage of the applications too constrictive. Hence the fate of epoxy resin losses and respective potential BPA releases into the environment were described qualitatively. Epoxy resins are created by mixing BPA and epichlorohydrin (ECH), before undergoing further chemical processes (read more about How epoxies are made). Depending on the application, epoxy resins can be used either in solid form (e.g. in automotive coatings), liquid form (e.g. in water pipes or flooring) or an in-between semi-solid stage (e.g. marine coatings or wind rotor blades). The amount of BPA used depends on the type of epoxy resin needed. The manufacturing process of diverse applications follows the same principle. Liquid epoxy resin (LER) can contain a maximum of ppm of unreacted BPA. For semi-solid epoxy resin (SsER), the maximum amount is 65 ppm of BPA. BIPRO’s analysis assumed worst case scenarios and therefore the actual amount of residual epoxy resin and unreacted BPA is likely to be lower. Overall, the research concluded that the 150,000 t of epoxy resins used every year in the selected 5 key applications could result in 573 kg of BPA being released into Europe’s environment due to the production of the resin, mostly via sewage. Calculations took into account the lowest performance rate of both disposal and waste treatment methods. Part of the released BPA is likely to be degraded by microbes and UV rays although there are no available scientific studies specifying what happens to BPA entering the environment. BPA losses during manufacturing of specific applications depend on the process being used. For this reason, each application is assessed separately. Epoxy resins were developed to increase the performance of specific products, hence when properly installed and maintained the risk of releasing BPA from epoxy to the environment is minimised. Determining reliable BPA estimates at each of these stages was not possible, especially for the service life and end-of-life stages. At waste stage, most uncertainties are related to the lack of available data and changing legislation across European countries. Water pipes: With regard to the application stage, leakages of BPA into water due to pipe rehabilitation depends on accidental cases when the prescribed mixing ratio of LER and hardener is not adhered to. Estimating the number of such malpractices was not possible, thus epoxy losses could not be quantified. Some losses are due to the cleaning of coating tools with water, although no quantitative estimations are possible. About 29 t of epoxy resin and 29 kg of unreacted BPA would be destroyed by thermally recycling metal mixing buckets used for coating preparation, thus exiting the life cycle. Proper installation and maintenance should yield no epoxy losses during service life. BPA detected in water running through epoxy pipes is likely due to improper curing of the epoxy. It is unclear how many pipes reach the waste stage each year. 575 t of epoxy resins used in metal pipes would be recycled annually via thermal treatment, degrading 6 kg of BPA. The fate of 2,298 t of epoxy in concrete underground pipes containing 23 kg of unreacted BPA cannot be determined at the moment. Concrete pipes may be recycled via crushing and grinding and used for road construction (without thermal treatment) or landfilled without any material separation, thus potentially degrading BPA further. Flooring: Tools used for the application of epoxy resin mixtures on floors are washed with water, releasing an estimated amount of 176 g of BPA annually into water bodies via sewage and waste water. From 450 t of epoxy resin used annually, an additional 4.5 kg of BPA would be thermally destroyed via recycling of metal buckets used for coating. Proper cleaning and maintenance methods would decrease the likelihood of BPA release during service life. Epoxy resins may deteriorate because of exposure to strong acids and lyes, acetone and specific organic solvents, thus causing BPA releases due to improper handling; otherwise no significant BPA loss is expected under normal service conditions. Similarly to end-of-life water pipes, epoxy-coated floors would end up as construction and demolition waste. Therefore, no quantification was possible because waste collection practices vary greatly from country to country. Assuming that all epoxy resin is to become waste at some point in the future, the fate of 45,000 t and 450 kg of BPA remains to be properly assessed. Wind rotor blades: A total of 1,015 t of epoxy resin waste is produced annually from windmill blade manufacturing at the application stage, releasing about 30 kg of residual BPA. The majority of this waste mass would be incinerated, alongside tools and auxiliaries. Some epoxy particles destined to gluing wind blades could be collected by local ventilation systems and blown out into the air. Potential BPA losses during service life are negligible (epoxies do not coat the surface of wind blades). Finally, at waste stage, experience in blade disposal is scarce. Several plants are dismantled and installed outside of Europe, hence it is not possible to determine precisely the fate of 24,162 t of waste epoxy resin and the resulting 707 kg of residual BPA. The majority is expected to be incinerated in cement kilns, thus destroying most BPA residues. Other disposal methods such as landfilling or material recovery could not be excluded either. Marine coatings: Up to 20% of the epoxy used for marine coatings could be lost during paint application (e.g. dripping) or as paint wastage (e.g. unused paint after coating process), end up being incinerated or enter the sewages. 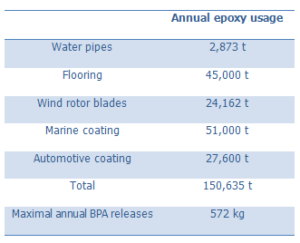 From the 51,000 t of epoxy used annually for marine coating, it is estimated that about 398 kg of residual BPA could be thermally degraded, while about 96 kg could be released to water bodies. During service life, the biggest source of release are decks coated with epoxy-based topcoats, susceptible to UV radiation. The number of ships with epoxy-coated decks is not known. Salvaging of end-of-life ships would pose the highest possibility of BPA release for marine coatings. Up to 95% of European ships are dismantled in Asian countries following not-known wrecking practices. The European Commission’s regulation on handling end-of-life ships will not be fully in force until 2020, but will only apply to ships with EU flags, thus some ships may change flag to avoid compliance with the new requirements. In total, the theoretical degradation of 8,000 t of epoxy resins in marine coatings from the 350 European ships could lead to 388 kg of residual BPA being released in the environment annually. 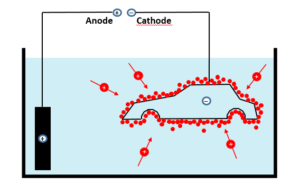 Automotive coatings: Primer residues gradually accumulating as sludge in dip tanks would constitute the highest potential sources for epoxy losses during Cathodic Electro Deposition CED coating (application stage). They would account for 788 t of waste epoxy resin containing about 51 kg of residual BPA annually. Sludge is likely to be incinerated, though landfilling could not be excluded. During service life of a car, 1% of the original coating would be lost. Taking into account the number of registered cars in 2013 across Europe (11.9 million cars), it was calculated that from the 225 t of epoxy resins in use, about 15 kg of BPA could potentially be leaching out to the environment every year. Recent European legislation mandates epoxy resins to be subjected to thermal decomposition. However, it is not possible to properly assess the final outcome of 13,230 t of epoxy resin at waste stage – corresponding 860 kg of BPA. Finally, it should be noted that the analysis only considered cars, without looking into other vehicles coated via CED technology (e.g. trucks, motorbikes). On top of this, epoxy resin particles could be released during storage and dismantling of end-of-life cars. Waste car bodies would be subjected to various treatment processes depending on a country’s waste legislation. • 1 ppm (parts-per-million) is equal to the distance between your arms extended, compared to the diameter of the moon. • 1 ppb (parts-per-billion) is equal to the distance between your arms extended, compared to the diameter of the sun. • 1 ppt (parts-per-trillion) is equal to the distance between your arms extended, compared to the distance from the sun to Saturn.